31 March 2008 — Beta testing can run the spectrum from breakneck-paced madness on one hand to an absolute morgue-like trance on the other. The trance is usually induced by a problem uncovered in beta testing that is soon discovered to be masking another problem, the solution to which could set you back further and futher from your destination. This past fall and winter, we had a number of these ups and downs. But the year culminated on a slightly up note, and we gave you all a last-minute gift, what we had tried to deliver all year long: a product that would allow you to see Helix in macOS. There were, as we said there would be, serious problems with the first Helix Engine Preview Release (also known as ‘Helix Engine 6.1pr1’) that we released on New Year’s Eve, but little did we realize at the time how high that up note might eventually lift us. The breakneck-paced madness part is exhilarating. You put a product into the hands of your beta testers and you are rapidly besieged with reports. The next days are spent deciphering them, determining whether there is any duplication, whether different testers are reporting the same problem in different words, and whether they are ‘show-stopper’ bugs or something that can be safely deferred to a later date. With our limited resources, prioritization is crucial. Some determinations need to be made quickly, such as whether a particular issue must be fixed before the product ships. For example, if a bug is merely cosmetic, it can probably wait. In these periods, it is important to constantly remind ourselves of how the immediate objective — running Helix natively in macOS (both PowerPC and Intel) — fits into the overall plans, to see where you are so you don’t become disconnected from the big picture while you’re mired in the details. Build Helix Server for macOS. Now if you’ve been paying careful attention, you may notice that getting everything to run natively on Intel Macs wasn’t one of the seven major steps in our original plan. That’s just another of the many punches we’ve had to roll with since this journey began. Where we always seem to be, scrambling to keep ahead of the vacuum cleaner that could sweep us into the proverbial dustbin of history. It’s hard not to think of the last few years as somewhat similar to freezing in lifeboats, waiting for the Carpathia to arrive. Now this same type of call used to come in about five or six months ago from people who just wouldn’t read beyond the headline, and when they saw things like ‘Helix… macOS… soon…’ they would run out and buy machines that won’t run Classic and suddenly found themselves in a bind. But these new calls were different. We know — we’re sorry we know it but we do know — that many people do not take time to absorb all of the information we provide, even critical information. Like the message that the Preview Release would expire on March 31 and that users must be prepared to revert back to Classic Helix after that date. So calls started coming in from people who worried that they wouldn’t be able to continue using Helix in macOS, as they have been doing since they first installed in early January. So it seems that Helix Engine 6.1pr1, something we half-jokingly referred to as The Little Engine That Can, has been merrily chugging away providing much needed relief for desperate Helix users. We thought it might be greeted with howls of indignation, but such was not the case. As that preview was being released, we were attempting to swallow a potentially bitter pill: we had to solve a bunch of printing-related problems and there appeared to be a chance that upgrading to a newer version of wxWidgets, a product we use in development, would do the trick. Fortunately, while it did solve some of those problems, it set us back almost three months. But it had to be done, for the sake of both Engine and Client. Now, three months later, most of those hurdles are behind us and Engine and Client are back in sync, just as we’d hoped. The macOS Client is, in fact, stable and well-behaved enough that you’ll be pleased to learn that it is finally in the hands of our beta testers. And, thanks — from the bottom our our hearts — to the Universal Helix pioneers, we’re also now testing Intel-native versions of our Helix products. Things are beginning to pop. Helix RADE Classic version 6.1.1 is available now. This release fixes two bugs and enhances one feature (Keyword Indexing). See the RADE product page for the full announcement. Helix Server for macOS (PowerPC) version 6.1 ships on Friday, April 4, 2008. This release is the first fruits of our work porting Helix to Xcode. It brings Leopard compatibilty and prepares the way for the macOS Client and Intel-native Helix Server. 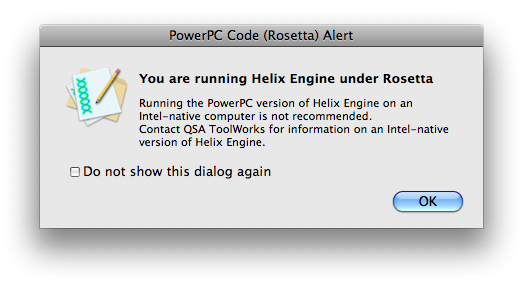 Helix Client for macOS (PowerPC) version 6.1pr1 (a Preview Release) will be available mid-April. Look for a public beta announcement soon. In the weeks and months to come, you’re going to start hearing about the thing you’ve all been waiting for … Helix RADE for macOS. We’re developing strategies for raising the funds we need to get through RADE And PiHC. As always, remember that it takes money to get there, so if you’re still among the hold outs waiting for us to get to macOS, please consider this a good time to upgrade.